We all do early protected movement after flexor tendon repair. Why? It avoids the inevitable stiff, useless finger; that is why. How many stiff useless fingers have come out of finger fractures that are K-wired? ​Many. I certainly created more stiff fingers before I started early protected movement after K wiring my finger fractures. How we do early protected movement for WALANT K-wired finger fractures: Reduce the finger fracture with K-wires with WALANT. Get the awake patient to actively move the finger right after you insert the K-wires. Look at the fracture and the K-wires move with a low power fluroroscope. Assess the stability of your K-wire fixation, and the ease of movement. If the fracture is moving too much, add another K-wire. The goal is NOT rigid fixation. The goal is functionally stable fixation, as in mandible fracture treatment. You only need enough stability that the fracture will heal in a good position of function. - During the surgery, educate the patient about immobilization and elevation for 3-5 days till you see him again in clinic with your therapist, or till the patient sees your therapist. Teach the patient that his hand is on strike above the heart until he sees the hand therapist. You do NOT want immediate movement in the first 3 days after surgery. Immediate movement encourages internal bleeding around the fracture, which will lead to callus and tendon trapping with more scar and more stiffness. Let the internal bleeding stop. Let the swelling come down. Let the work of flexion decrease. Let the friction decrease. Let the fracture get just a little sticky. Remember that collagen formation does not start till day 3 after wounding. Most importantly, let the patient come off ALL pain killers, including acetaminophen and ibuprofen. "Your pain is your body's only way to say to you: "Sally, would you stop that? I'm trying to heal in here and you are messing it up! Stop it! You need to listen to that little helpful voice in your head (the pain) to avoid taking your fracture apart and getting infection from the pins I just put into your finger. You can't hear your body talking to you if you have Advil or Tylenol in your ears!" - By 3-5 days, in cooperative patients who are now off of all pain killers, your therapist begins pain-guided early protective movement just like in flexor tendon repair. The patient cannot do what hurts to avoid losing the reduction and to avoid K-wire infection. They only need to make up to half a fist at most; just enough to keep the tendons and joints around the fracture gliding so they don't get stuck. No more than 45 degrees of movement at MP, PIP, or DIP is required. The patient comes out of the immobilizing whole hand splint to do this protected movement several times per day, depending on the pain. They can stabilize the fracture with the fingers of his other hand if this decreases the pain. They do not put their hand below the level of his heart until it no longer hurts to do it. When the fracture is no longer tender to palpation, the fracture is healed in the sensate finger, and the K-wires can be removed. This clinical healing sign is far more useful than Xray healing in finger fractures. Xray healing is useless in finger fractures. Anyone who has done finger malunion surgery has seen non-healed Xrays with very healed fractures. We remove K-wires between 2-4 weeks in most patients in whom the blood supply to the bones is good (closed reduction and K-wire fixation). If the periosteum is stripped with open reduction or open degloving injuries such as wood splitters or table saws, the K-wires will need to stay in longer because it takes longer to heal the bone. I am willing to bet that most other hand surgeons would go for it as well, if it was available. Contraindications would include patients who cannot get off pain killers, non-cooperative patients, grossly comminuted fractures with very little stability, and very unstable intraarticular fractures. I have been doing this for many years and I promise you that if you try it, you will like it. The stiff finger is much less common. The only downside is loss of your reduction and the possible need to K-wire again. This is a minor price to pay compared to redoing a flexor tendon repair with a rupture after early protected movement in that scenario. I have only occasionally had to redo the K-wires because of this problem. 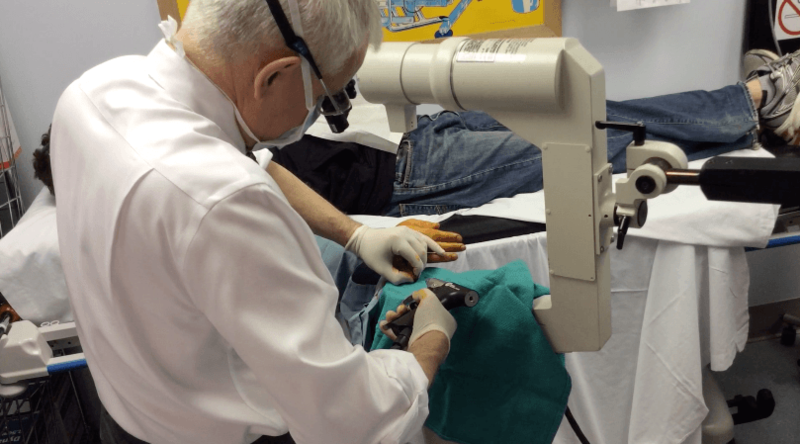 Find out more about how this technique is performed at the Walant University and go to the Trauma course. Don is a Professor of Surgery at Dalhousie University in New Brunswick, Canada and is the most published surgeon globally in the subspecialty area of Wide Awake Hand Surgery including the definitive book on the subject. He is ex-president of the American Association of Hand Surgery, The Canadian Society of Plastic Surgeons and Past Chairman of the American Board of Plastic Surgery.